This body camera is advertised, manufactured and sold by several Chinese Companies. In the United States, it is most popularly sold as Stuntcam’s Patrol Eyes brand. This body camera seems durable, has a strong mounting clip and average battery life. Drawbacks to this camera include bulky weight and big size. We give this camera a 2.5 star rating for ease of use, good mounting clip and average features and quality. The camera has a fixed static lens, limiting its mounting options and recording angles (Officers with taller stature or bigger chest, risk ending up pointing to the sky). It’s able to connect to an external camera, but this feature is not prominently promoted. Drawbacks of the camera include its weight and size. At 6.6 ounces, the camera is bulky and pulls on the uniform. The camera comes with a strong 2.5″ alligator style rotatable clip, which has teeth for strong gripping, so this clip seems like it would maintain a secure grip on a shirt or uniform. This body cameras clip is non-adjustable; the “hinge” style connection is close to the camera, giving no room for pivoting the camera for better video angle. The clip is also very tight and seems like it will last a long time with regular use. This body camera has well designed button placement and seems easy to use. All of the function buttons are on one side. The body camera beeps and vibrates slightly when turned on and off and when it starts and ends recording. This body camera has a 6.5-8 hour battery life (depending on video quality settings). The camera offers one touch recording capability, but you must press and hold for 3 seconds. The buttons beep loudly when pressed but the volume can be turned off to make using the camera more discreet. The body camera operates by buttons only (no switches). (We recommend switches over buttons because it is possible for an officer to forget they pressed the button or must press and hold for several seconds before the camera starts up; with switches, the officer can quickly visually and physically feel that the switch is on or off). To activate the body camera, you can either press and hold the power button for about 3 seconds or press and hold the video button for 3 seconds to begin recording. There is about a 3 second start up time before the body camera starts recording. The camera’s status light is continually lit up green on the top of the camera when the camera is powered on and the status light turns solid red when its recording. This status light risks giving away the officers position at night or if an officer is in a tactical situation where it would give away his position. The body camera has a 2″ playback screen on the back, which can be turned off. Playback screens are helpful, but drain a lot of battery power. There is the ability to turn the screen off and you can access the menu and configure settings using the playback screen. The camera seems durable. Weather Resistant with an IP57 rating. The manufacturer says this body camera has a 10 foot drop rating. The top video quality is 1080p but the 140-degree field of view gives the video a slight distorted “fish eye” look. The camera can also record a 170-degree field of view in 480p mode, but again there is a fish-eye distortion. The body camera has Infrared night vision up to 32 feet that can be activated with the press of a side button. This body camera offers still picture, audio only and video recording functions. The camera also has a built in laser pointer. 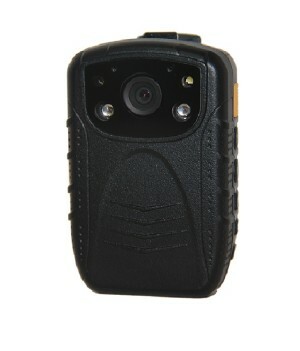 The camera has a Push to Talk (PTT) feature that allows an officer to connect the body camera to their police radio and use the body camera as a speaker microphone to save space on the uniform, however the connection point for the PPT radio does not look like it will accept all police radios. The camera has a 10 second Pre-record capability.